Hi. My name is Tami…and I am a cookbook addict. You think I’m kidding? Ask me how many I have coming to me from Amazon right now. I need an intervention. Seriously. 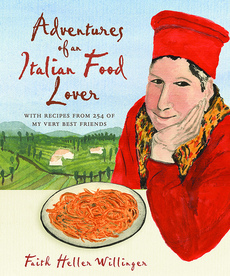 I received a copy of Adventures of an Italian Food Lover by Faith Heller Willinger months ago. I got it right at the tail end of the blog event that Cath over at A Blithe Palate hosted. If you missed it, go check it out here…so many great entries. …and then it sat…and sat. On top of it went Bittman (man he’s heavy), Flay, Hay, and the 4 Ingredients and 10 Minutes cookbooks I found in the sale bin at TJ Maxx. Wait till you see what I cook in just 10 minutes with only those 4 ingredients. MacGuyver, look out. Today…I re-visited Adventures of an Italian Food Lover and made something tasty and delicious: smoked mozzarella cutlets. How can fried, gooey squares of smoked cheese ever be bad? Grown up cheese sticks? Yes, please. The recipe was super easy, delicious, and worth my house smelling like fry oil for the time being. 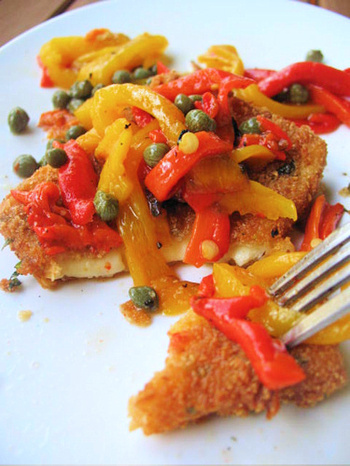 To soften the blow of eating a block of fried cheese, I topped them with a quick salad of roasted red & yellow peppers, capers, good balsamic and extra virgin olive oil. It gave a little fresh zing to them, which was appreciated. I’ll be working my way back through this book again to try out some of the seafood dishes, for sure. Nice going.. I am going to have a way to smoke cheese in the next couple weeks. I just can’t wait.What should I try first? Yum! Looks delicious. I totally do the same thing of adding veggies where ever I can. Did you dredge the cheese in eggs first, or just coat them in breadcrumbs? Its a double dip thing. A dip in egg…then breadcrumbs…then egg…then breadcrumbs. Coating stayed on nicely and got crispy. I love fried mozzarella (but on its own). One of the most traditional dishes from the south of italy (my country)!!! It looks so yummy, love the idea of adding vegetables! love the photo you made!! great shot! As sinfully delightful as fried cheese sounds, the thing that got my mouth watering was the word capers. You’re exactly right. Something as rich as this needs something tart and lively to balance all that richness. I’m thinking some nice fresh orange segments fanned alongside the cheese would do the trick too.